At least 13 people have been killed in a suicide bomb attack in Pakistan's eastern city of Lahore, police say. More than 60 others were injured when an explosives-laden car targeted a building housing an anti-terrorist wing of the federal investigative agency. The amount of explosives was so large it brought down the two-storey building, correspondents say. Close to the country's border with India, Lahore has been hit several times by militants over the past year. Pakistan's government condemned the attack, blaming the "hired killers who want to destabilise Pakistan". A spokesman for the Pakistani Taliban told the BBC they carried out the attack. The police said that the blast had taken place at a building housing the offices of the Special Investigation Group, an anti-terrorism wing of Pakistan's Federal Investigation Agency (FIA) in the Model Town area of Lahore. The offices were used to interrogate suspected militants but officials said there were no "important suspects" in the building at the time. A nearby religious school was also damaged. 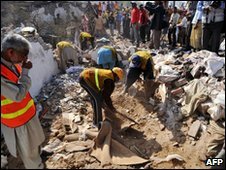 The BBC's Aleem Maqbool in Islamabad says the emergency services are working to free those trapped under the rubble. Passers-by, including children on their way to school, were said to be among the dead and injured. Lahore police chief Pervaiz Rathore told reporters: "It was a suicide attack. We have heard that 40 to 50 people were in the [investigation agency] building when the incident happened. Rescue work is in progress." Eyewitness Noorul Huda, a student at a religious school, said he was in class when an explosion shook the area. "With the huge bang, blocks and pieces of the roof fell upon us and six of us were wounded," he said. "It was total chaos outside and people were running and crying for help." One resident, Mohammad Musharraf, told Associated Press that locals had urged the authorities to move the anti-terrorism unit as they feared it would be targeted. Pakistan's Interior Minister Rehman Malik, quoted by Agence France-Presse news agency, said the Taliban were involved in almost every blast in Pakistan. "The ammunition and weapons are coming from Afghanistan." Pakistan recently stepped up its drive against the Taliban leadership, arresting the military commander of the Afghan Taliban, Mullah Abdul Ghani Baradar. A number of other top figures are also reported to have been arrested this year. 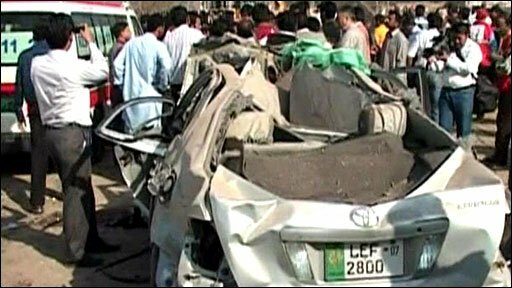 FIA offices in Lahore have been the target of two suicide attacks in recent years. More than 26 people died in those attacks. There have been a number of other explosions in Lahore over the past year. Last December, two bomb blasts at a busy market killed at least 48 people and injured more than 100.